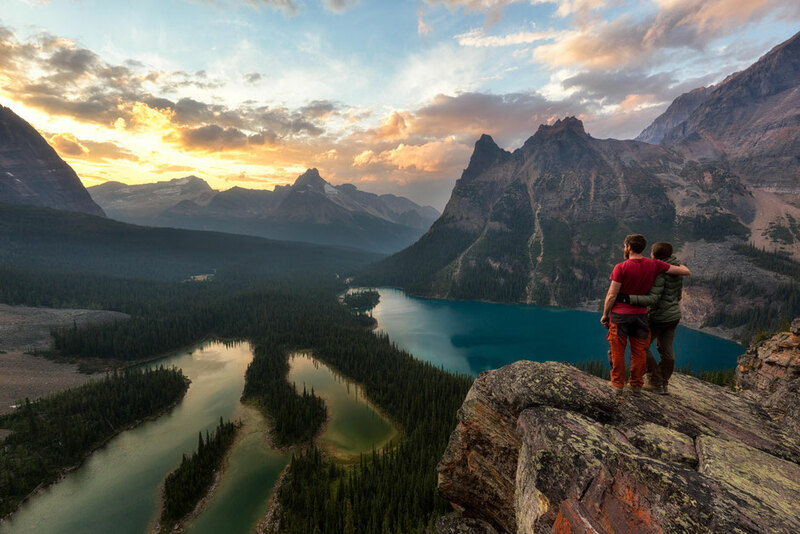 There's been a huge shift away from city vacations, resort holidays and booze cruises toward adventuring in the true outdoors and it's been gaining more and more traction in recent years. Maybe it's the Instagram 'mountains and fedora' craze or maybe it's because being in the outdoors is awesome and word of mouth is creating a snowball effect. Whatever the reason I think it's a good thing that more of us lean towards spending some quality time outside, away from technology and close to nature. Where am I going with this you may wonder? 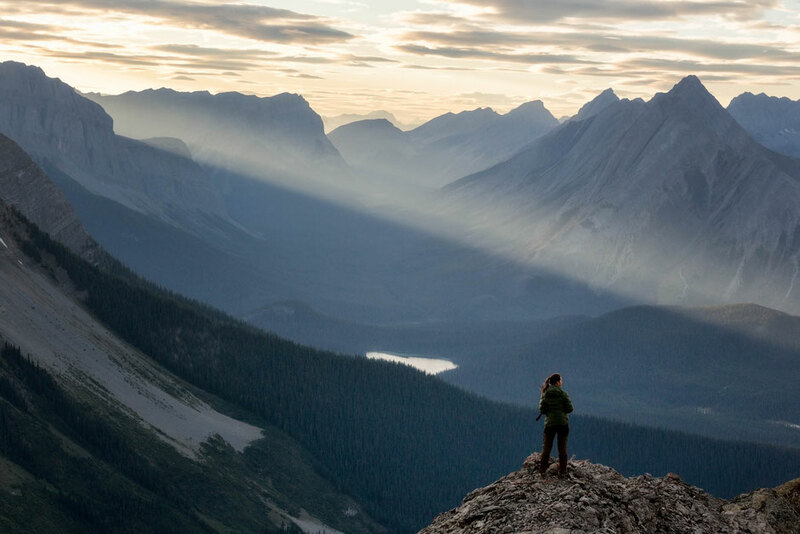 I have spent more than a year hiking and photographing the Canadian Rocky Mountains. I completed hundreds of kilometres of trails on day and overnight trips. Naturally I didn't exhaust the possibilities. For that I fear a lifetime of exploring wouldn't be enough. I did however discover a few of my favorite trails, which I am going to share with you today. Why do I favor them over others? Some due to their very limited human traffic and remoteness, others because of the great wildlife viewing possibilities, but mainly because all of them offer truly breathtaking views. Something I am a huge sucker for. A scramble up Smutwood Peak is an absolute corker. The hike starts as an easy ramble along a creek before emerging out on subalpine meadows. Soon you will cross an unbelievably destructive avalanche path and start the steep ascent to the Birdwood Pass. From here the two Birdwood Lakes will be right in front of you and you will get your first glimpse of the Mount Smuts, still an hour away. I spotted a sow with her cub swimming in the lakes when hiking on this trail, and many other hikers reported the sightings too. 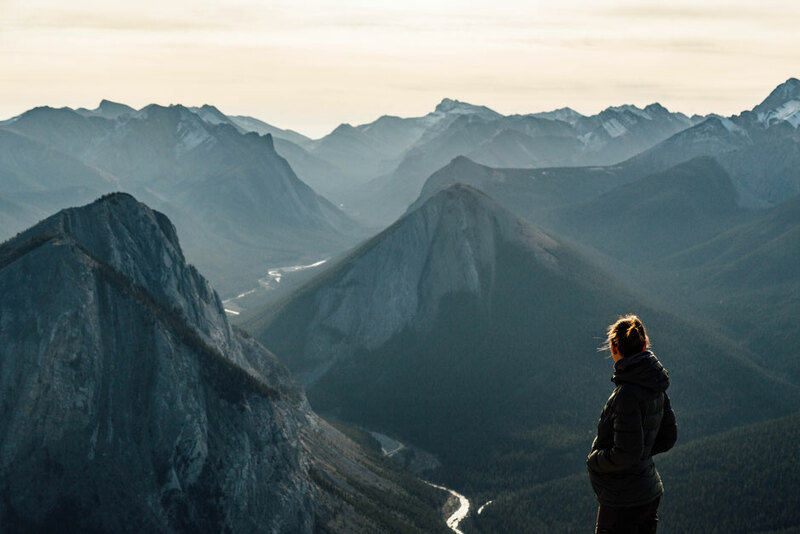 The view of Mount Birdwood is the reason that this hike isn't only one of the best hikes around Canmore and Kananaskis Country but makes it to the top of my list of the best day hikes in the Canadian Rockies. 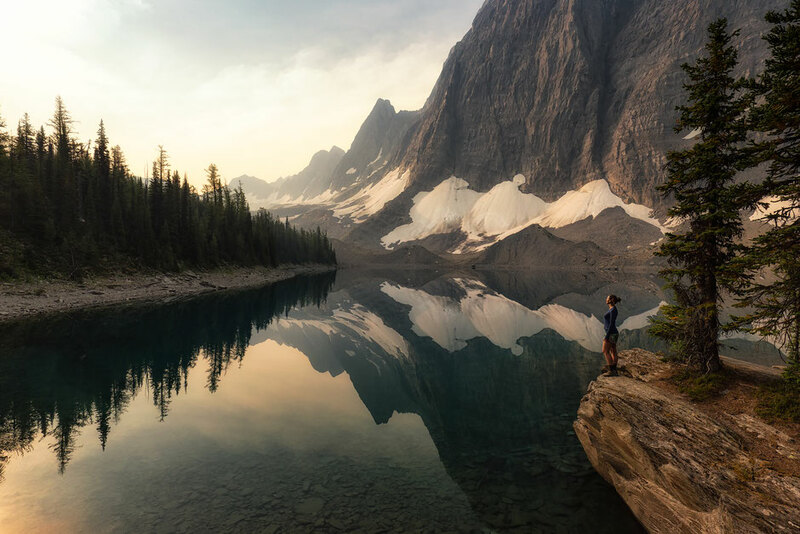 The Lake O'Hara Alpine Circuit is 12 km in length and it's a combination of the following trails: Lake O'Hara shoreline hike, The Wiwaxy Gap, Hueber Ledges, The Yukness Ledges, The Opabin Plateau and the All Souls Alpine Route. Together they circumnavigate both Lake O'Hara and Mary Lake at varying elevations, giving you incredible vistas, at all times. In this case however, fame and beauty come at a price. The daily bus shuttle runs only a few times a day, limiting your chances of visiting the Lake O'hara region on a day trip. Moreover scoring a reservation is nearly impossible and requires some serious determination. 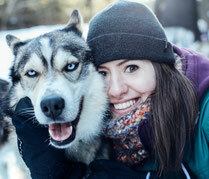 My complete guide to Lake O'Hara will help you with the booking process so you don't miss out! 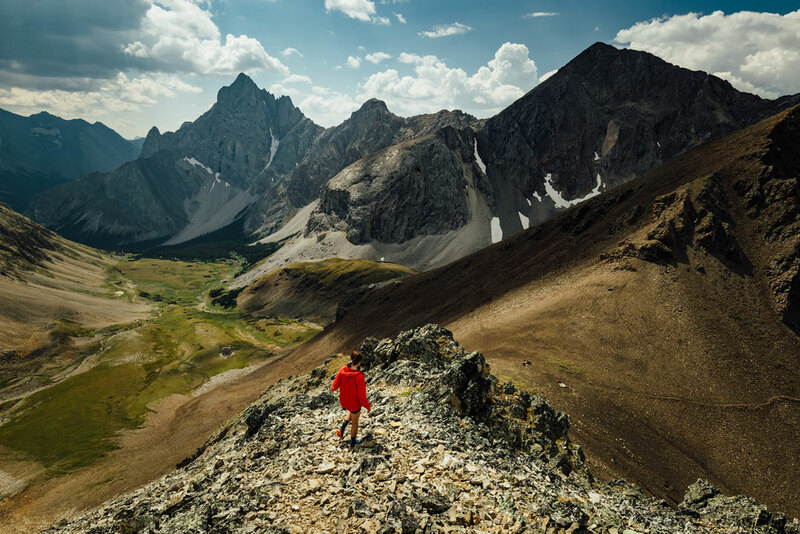 Pocaterra Ridge is a very rewarding relocation hike in Kananaskis Country - my favorite region for hiking in the Rockies. Heading from North to South the undulating ridge has 3 distinct peaks which offer incredible views whichever way you look. 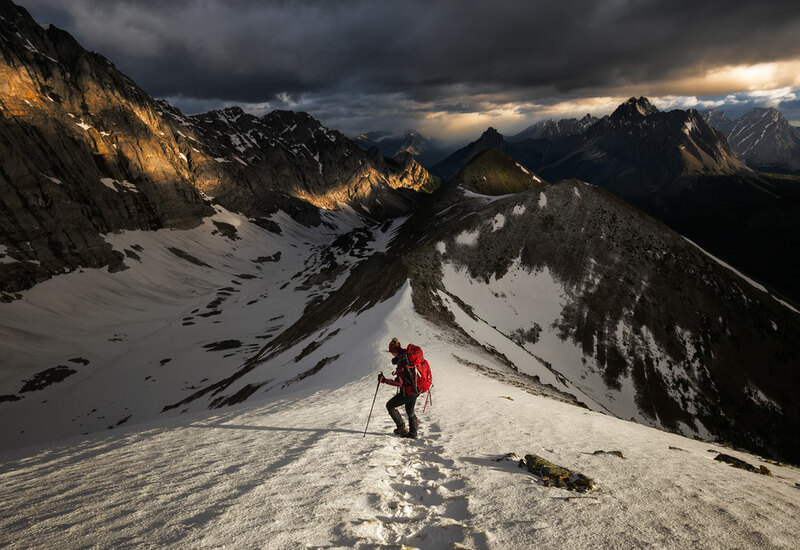 The hike is very popular in September when the larches turn yellow, but I chose to tackle the Pocaterra ridge in late Spring in some very challenging weather conditions. 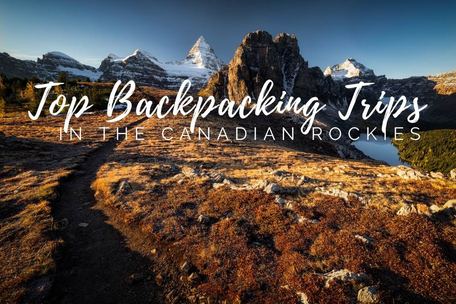 Being one of the most impressive hikes in Kananaskis, it's surprisingly not very well known, in comparison to some of the other hikes in the area. The hike up, and then along, the Indian Ridge in Jasper National Park starts with a gondola ride. 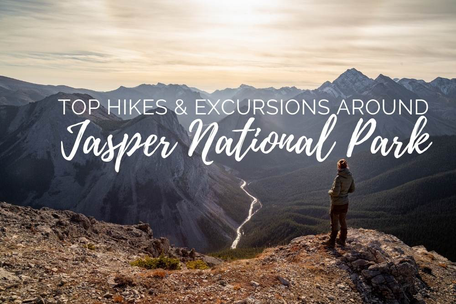 This means instead of tackling the first 10 kilometres and 1000 metres in elevation up on foot, by using the Jasper Skytram you are fit and ready for the challenge within minutes. From there you will start ascending first to Whistlers Summit and then towards the ridgeline. The views are uninterrupted from the start and stretch for miles ahead! On a clear day you can even see the summit of Mount Robson - the highest peak in the Rockies. 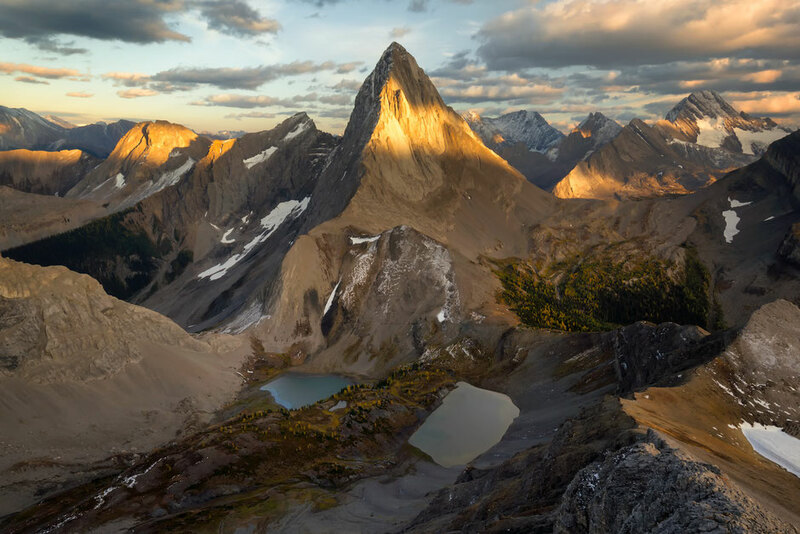 Another one of the incredible hikes in Kananaskis Country, Tent Ridge is an 11km loop which starts not too far from the Mount shark trailhead and Mount Engadine Lodge. It's easy to miss it, as it's not marked and often mistaken with the trailhead of Birdwood pass and Smutwood peak that is nearby. The path up Tent Ridge gains elevation through the forest before emerging out onto a wide ridge showcasing mountains in every direction. It's easier to follow the loop clockwise. Tent ridge similarly to Pocaterra ridge is very popular in larch season, usually around the second half of September. When hiking Tent ridge during favourable weather conditions you can see the summit of Mount Assiniboine in the distance. Floe Lake is the last stop on the much longer Rockwall Trail, another one of the greatest multi-day backpacking trips in the Canadian Rockies. If you don't have the time to complete the whole trail you can just go on a day trip to Floe lake. It's neither short nor easy, but the reward awaiting you at the end is great! From the trailhead it undulates through an old fire zone before quickly switchbacking to the alpine lake. The glacially fed lake turns all shades of crazy blues and green in the glistening sun. If you can, consider staying the night at the campsite located right by the shoreline. 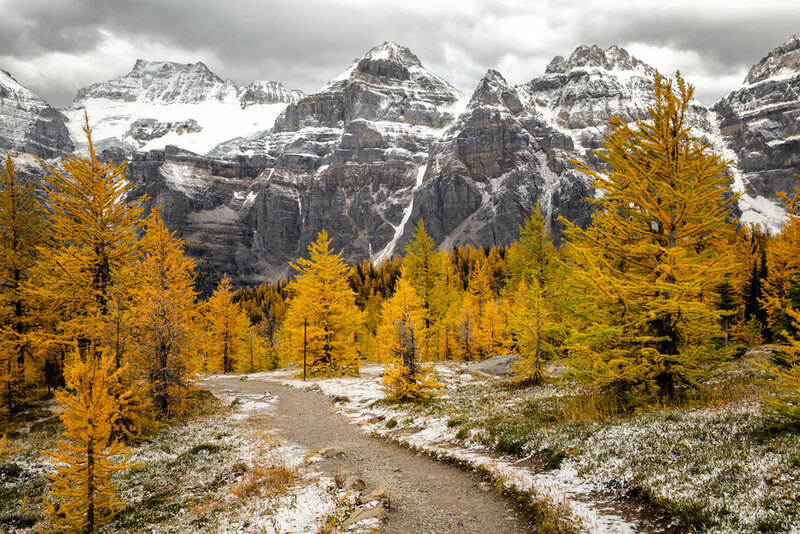 Another hike that is sublime all year round, but gets a crazy amount of attention during larch season (September) is the aptly named Larch Tree Valley. Starting at Moraine Lake, one of most famous photography spots in the Canadian Rockies, the trail switchbacks quickly before emerging out in these sparse alpine meadows filled with larches. One of the reasons I love this hike is that you don't have to put too much effort to be rewarded with beautiful views! However I would highly recommend to start early to beat the crowds! Also bear in mind when hiking in Lake Louise that restrictions are often in place due to high grizzly bear activity. Hiking in a group of minimum 4 people is not only recommend but often enforced. The route to Piper Pass is special to me for several reasons. One, the first stop is Elbow Lake, an incredible reflecting lake situated below steep mountains cliffs. Two, the route is seldom walked, meaning less people, less rubbish, more wildlife and more solitude. Three, the views are to die for and four, it can be shortened or extended however you please, depending on your physical needs/limitations/energy levels. Don't get me wrong it can't be turned into an easy stroll, it's still a mountain pass but it's certainly worth looking into whilst you're here. The summit is actually not the most rewarding part of this hike, incredibly the most rewarding part lies directly at the trailhead upon returning down. The Miette Hot Springs mark the start of this trail, so you know what that means!!!! A lovely soak in the tub after completing another one of the best hikes in Jasper National Park. The views at the summit come in a close second after the soak in the hot springs. The uninterrupted 360° panoramic vistas down all the adjacent valleys and along all the nearby ridge lines. 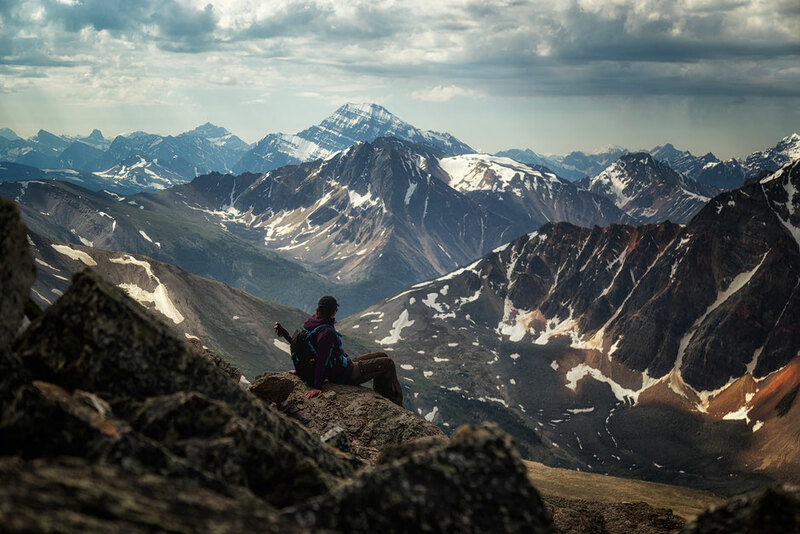 The Icefields Parkway is home to many hikes, but the one with the best views to effort ratio is Parker Ridge. 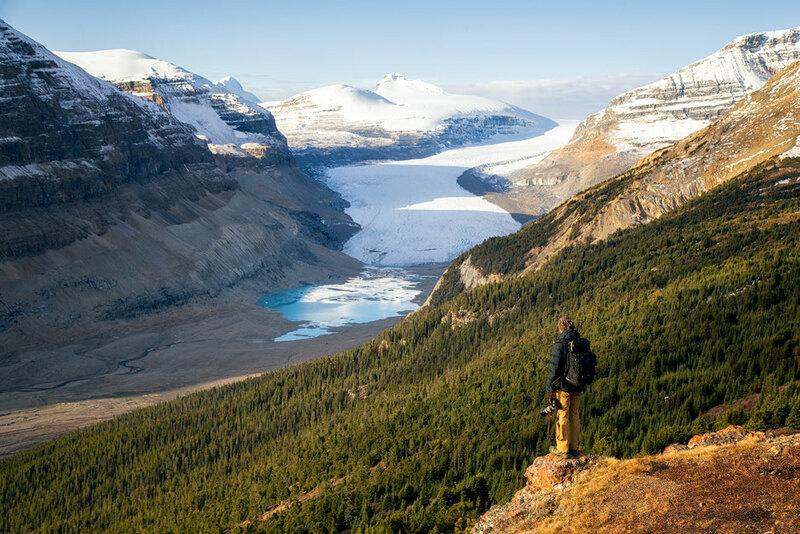 It lies a few clicks south of the Columbia Icefield Discovery Centre. The view pictured above from Parker Ridge is of the Saskatchewan glacial tongue. Unfortunately it's disappearing at an alarming rate due to global warming. Alpine flowers can be seen gracing the meadows with their presence in the summer and mountain goats and bighorn sheep can be seen frequently in adjacent valleys and on rock faces. It's like walking through a Disney Movie.